Quick Peek at ShoreTel Connect – What’s in ShoreTel V15! Deploy in the Cloud, on premise or Both! For those of us who have been working with ShoreTel since version 3.1, the introduction of a new ShoreTel release is always exciting! The marketing folks are naming this release, ShoreTel Connect to underscore the full power of a deployment that integrates both the customer premise with the flexibility of a cloud solution. It may be Version 1 of ShoreTel Connect, but it builds on all that ShoreTel has learned over the years and will always be ShoreTel Version 15 to the rest of us. The product extends ShoreTel’s history of distributed switching to now include cloud components like a new “Edge Server”. As we were fortunate enough to be deploying for a new client, we though we would share our first impressions and show you the new Shoreware Connect administration interface and the ShoreTel Connect client! The product is now in controlled release and shipping to new client deployments. There is a direct upgrade and migration path if you are on at least ShoreTel 13 of the iPBX, Version 8 of the ECC and Mobility 7! Reinstall or step upgrades will be required if you are on an earlier version of ShoreTel. You will need to shed the 32 bit operating systems as the new release runs only on supported 64 bit 2008 and 2012 Servers. The Virtual appliance OVA images introduced in Verson 14 are still available and though you can virtualize with VMware ESXi 5/5.1 or Hyper-v 6, we believe that the appliances still only run on ESXi hosts only. Going forward ShoreTel is focused on its 400 family of SIP phones. They have also introduced some new high density ShoreGear Switches including a 500 port switch, a 48 port analog switch and dual T1/E1 switches! No longer will you need to trade DSP resources to enable analog or media termination points and they have even enhanced the paging port with a contact closure! We are very pleased to see the addition of an ova file that enables you to field a distributed voice mail server as a Linux appliance! Hopefully ShoreTel can continue to migrate away from Microsoft servers, further reducing cost and increasing up time! The fat desktop client has been replaced with a browser like client thus eliminating the need for a Microsoft desktop. In fact, the administrative interface no longer demands an IE browser as Safari, FireFox and Chrome are now supported! Clearly, this means that the ECC client has changed as well! New ShoreTel Connect administration Portal and desktop client! 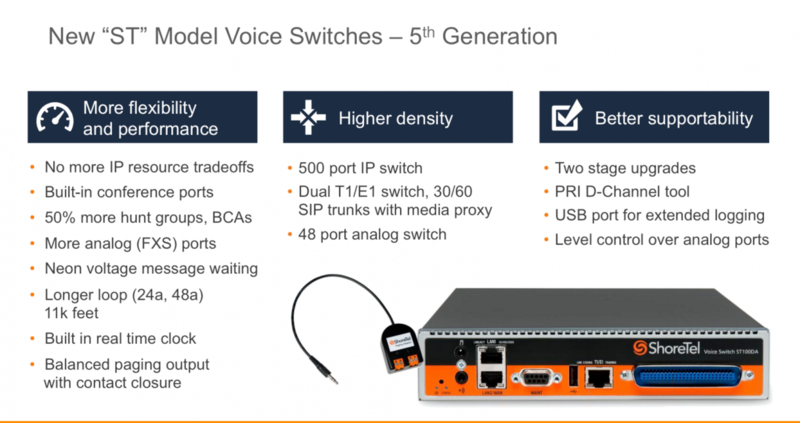 ShoreTel Connect can be deployed as a cloud solution, as a completely CPE solution or as a “hybrid” solution that blends both componet options. We have not had time yet to study the firewall traversal options, but I am sure this has all been thought out! The accompanying video will give you a quick overview of the administrator interface and the new client. We will continue the video development as we complete the deployment, sharing what we have learned along the way and updating our video training library. Hit us up with questions and challenges! We are long time Cloud Architects!